September | 2015 | Between Two Tides. According to the history notes inside the Romanesque Church, it was built between 1125 and 1150, which coincided with the arrival of the Knights Templar, after the territory was donated to their Military Order. Their mission was to protect pilgrims travelling the route toward the Holy place of the Church of St. Jaçques de Compostelle in Spain. The Church of Genis du Bois provided a stopping place for pilgrims to rest, and pray. 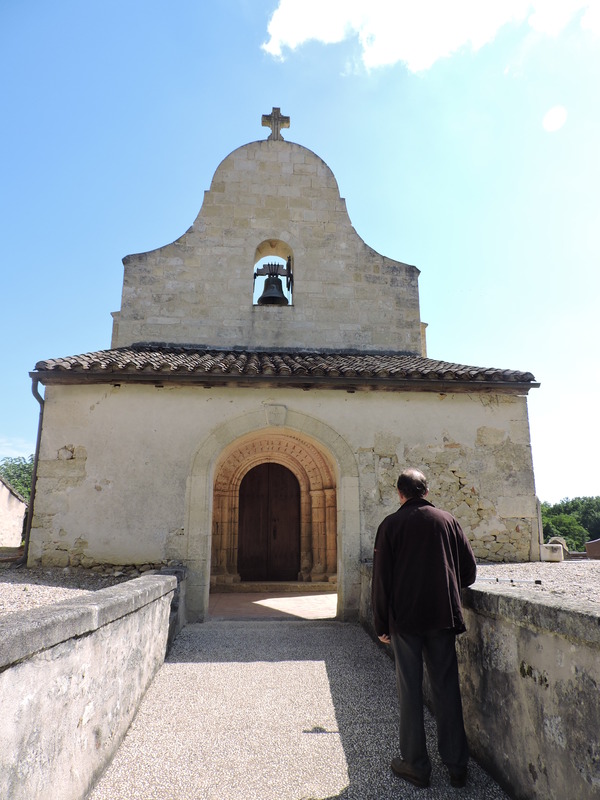 It is typical of many churches in the south west of France, with a simple rectangular form, in thickwalled stone on three sides, and a rounded sanctuary wall on the east. It has an open bell tower, and a porch before the entrance. 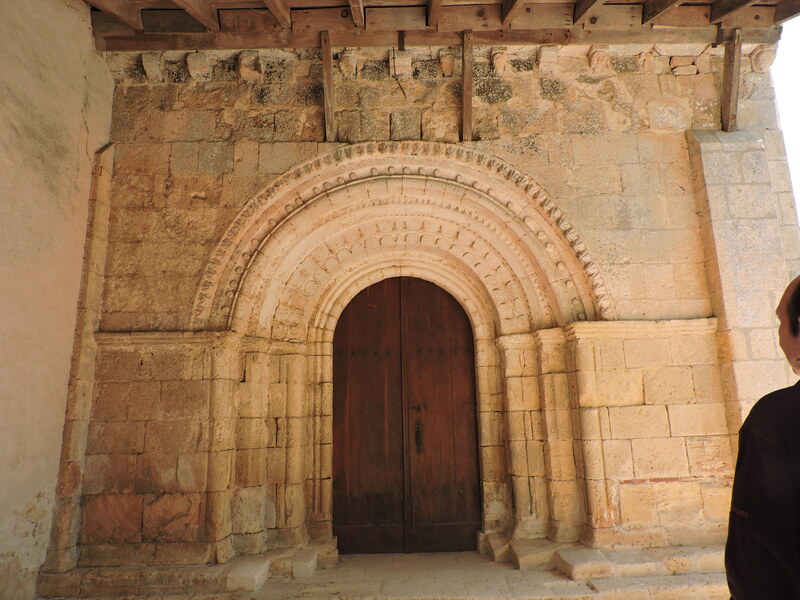 The doorway itself is occidental with four archivolts, decorated in sculptured stone. Each arch draws us, through layers from the “outside” to the “inside”. One arch in particular is decorated with the scallop shells that represent the pilgrimage of St Jacques de Compostella, a sign that it is a pilgrims Church. 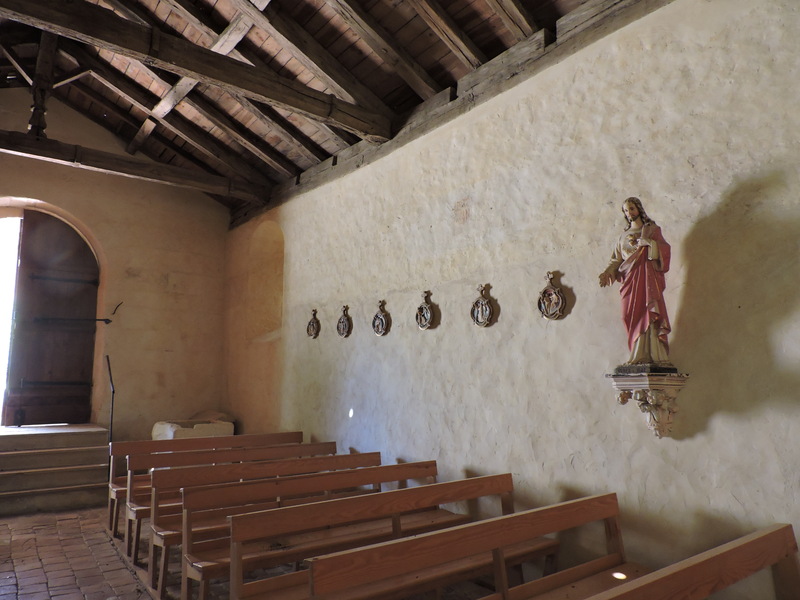 Inside, the Church is very simple, having no central aisle, and several small windows. The colours on the wall at present are warm. 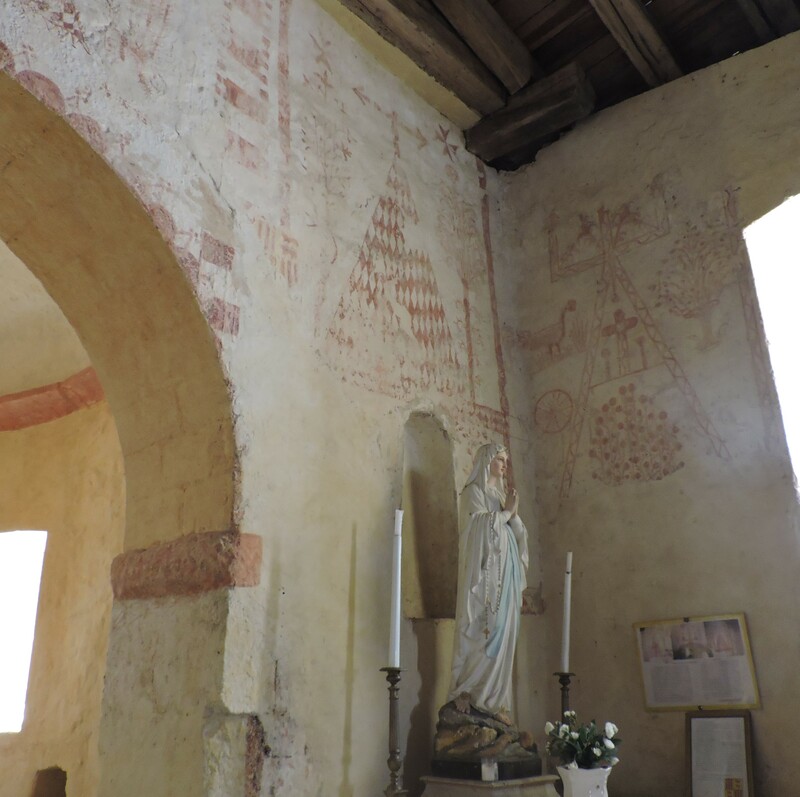 The most interesting aspect of this Church is the ochre mural on the chancel wall leading into the sanctuary. The mural displays its date, 1522, and the whole is organised in a vertical band of geometric forms in red colour. In the usual method of the time, the ochre was painted onto the plasterwork before it was dry, and the painter drew guidelines beforehand. It is painted using decorative graphics, and uses symbolic images to refer to the vows of the Knights Templar, and Hospitaliers, those being, obedience, chastity, and poverty. The Order of the Knights Templar is represented by Crosses with eight points. The Eternal Sun is present, a symbol regularly used by the Templar in their seals, and emblems. A bushcock reminds us of the story of St Peter, who denied Christ three times. Or it might represent immortality, and ressurection. The thistle confirms the values of poverty, vigilance, purity of intent, and chastity. The triangles represent the body of Christ, and are embellished with checkered diamonds. The Crosses speak of Christs sufferance, and ressurection. We also see a variety of trees, reminding us of the trees of knowledge and life, and perhaps those of peace, such as the olive. It so happened that we discovered this Church in passing, at midday. 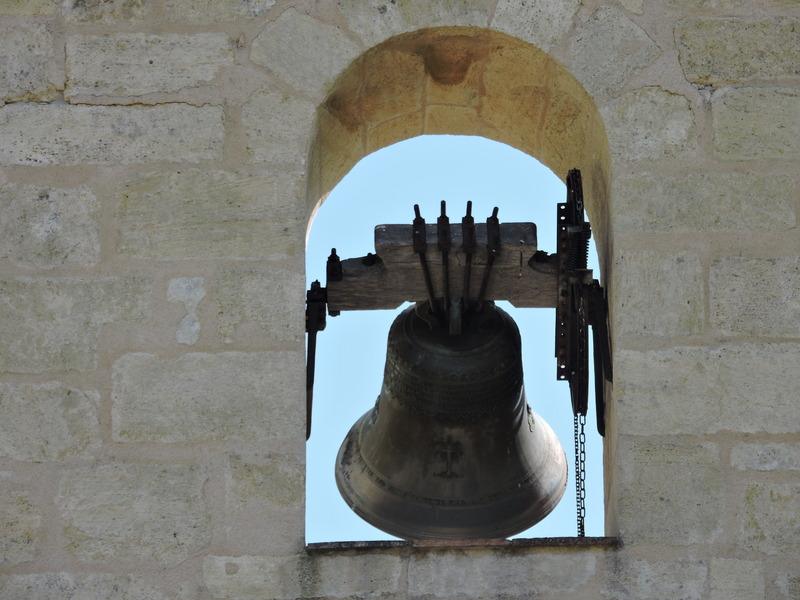 As we walked up the pathway, the bells began to chime, and call the “Angélus” (angels). We were reminded of the old days, when workers had no clocks. The morning bell signalled it was time to go to work. The midday bells, that it was time to rest, and eat, and later again,the evening bells, that it was time to go home. Flowers bloom brightly in the villages of France..
Bertrand arrives at his workshed at 8 am, and plans his day according to the season, and the needs of his flowers and shrubs. In spring he orders flowers from the catalogue, then pulls out the barrel pots to fill them with compost in preparation for his floral displays. Through the growing season there is grass to mow, hedges and trees to prune, and flowers to water. In autumn all has to be stored away, leaves need collecting, and in December, christmas lights to put up. Apart from the gardening chores, his duties extend to general maintenance of the village gîtes, as well as municiple buildings. 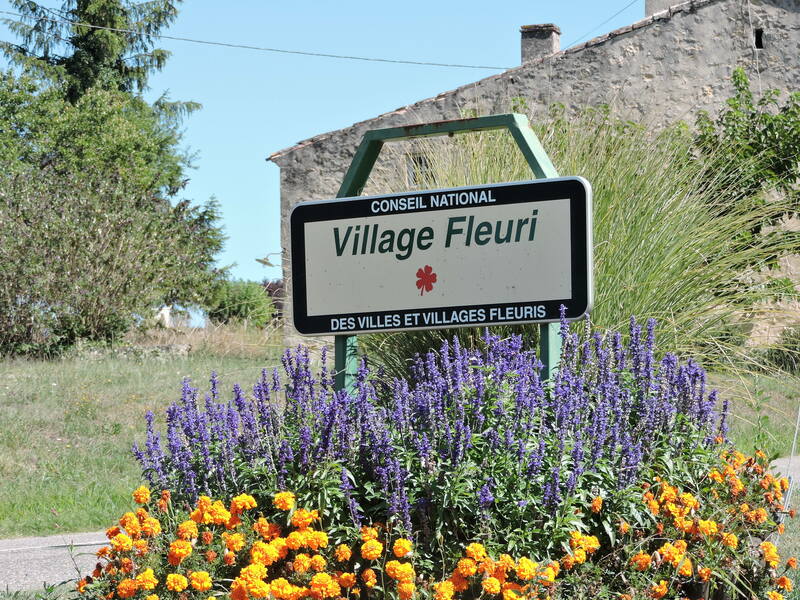 His responsibility to create a beautiful village is demanding, but his reward is, a flower from the ‘Concours des Villes et Villages Fleuris’. 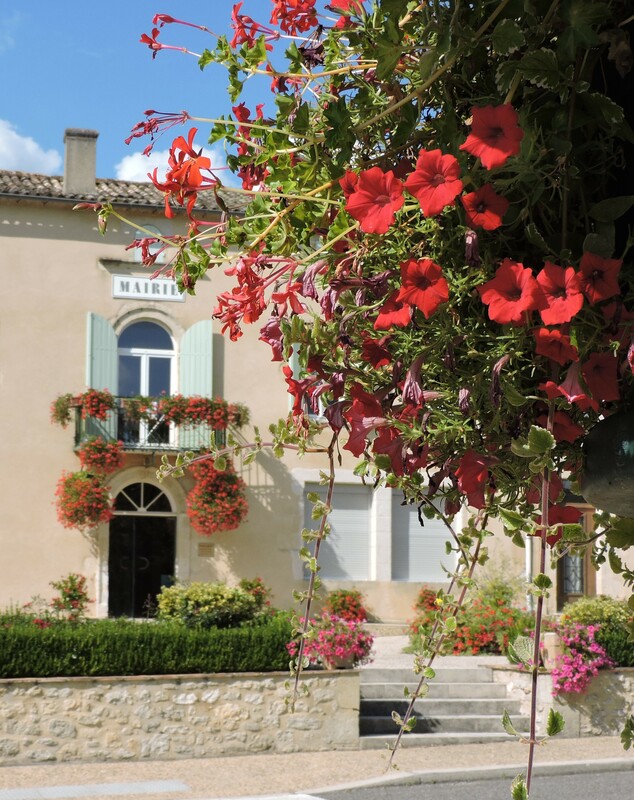 12,000 cities and villages across France, participate in the ‘Concours des Villes et Villages Fleuris’ ( flowerdecked cities and villages contest). This contest awards participating communes with one flower to four, depending on criteria realised, such as; attractiveness of floral decoration, tree health, landscaping, wild plant flowering, water ecosystems, and more. The highest award is the golden flower, given as special commendation. 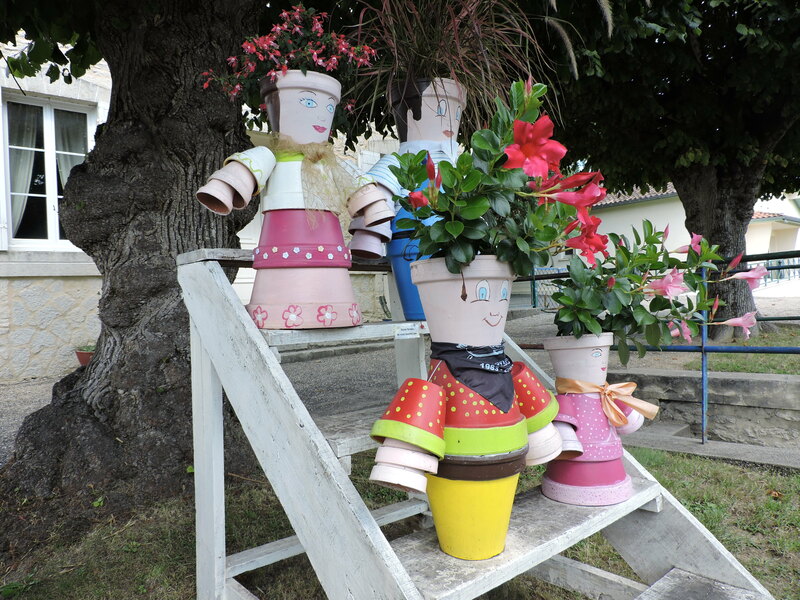 The village school in St. Vivien de Monségur, display their flowerpot men. The historic roots of this contest take us back to the early years of the twentieth century, and the beginning of tourism. 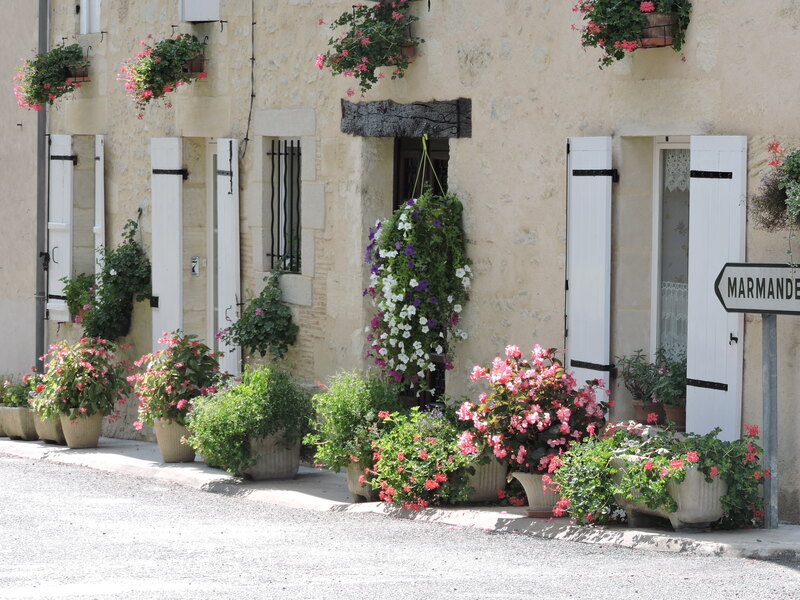 In the interest of attracting customers, hotels and railway stations competed in horticulture, and this idea grew when The French Touring Club created the first competition for villages in the 1920’s called ‘Concours des villages coquets’ (cosy villages contest). 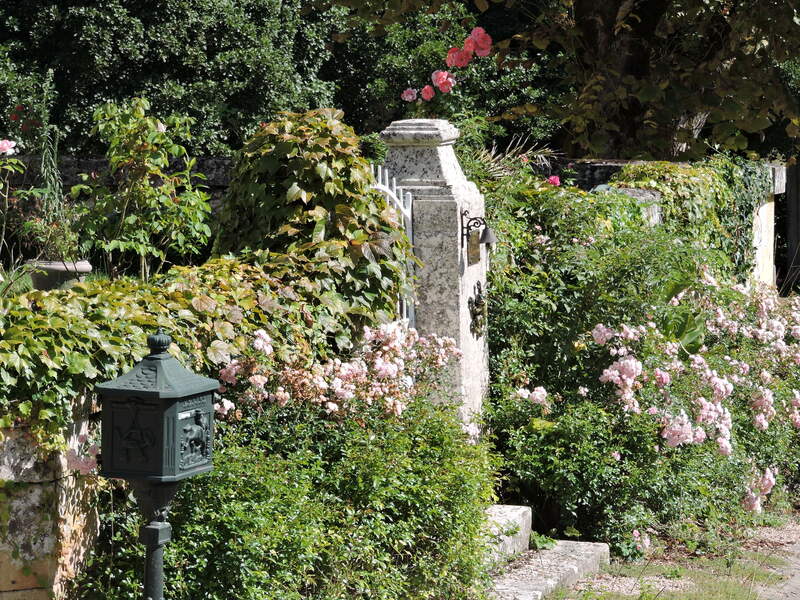 After World War 2 the club went further to create the ‘Routes Fleuris’ (flowerdecked roads). Its success led to the present ‘Concours des Villes et Villages Fleuris, (flowerdecked cities and villages contest) set up in 1959, administered by the Conseil National, with links to the Ministry of Tourism. St. Vivien de Monségur, 3 flowers. This contest initiated a European competition called, ‘Entente Floral Europe’ (europe floral harmony), which began in 1975 between France and Britain, and now includes all members of the E.U. The aims of the Conseil National to improve green spaces, and quality of life for the inhabitants, and tourists alike, is a great success, and beautiful too. A Golden Flower is deserved! 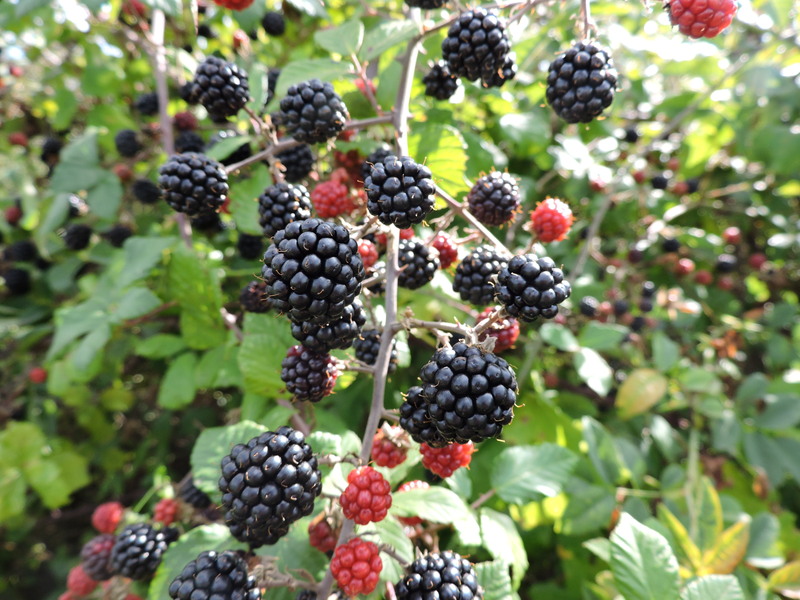 Purple fruits are adorning the hedgerow, orchard and vineyard, just now..
blackberry picking, you’ve been and done! Through september, when ripeness, and weather dictates, the vendange (harvest) of wine grape commences. Wine grape has been grown in L’Entre Deux Mers, since the Romans occupied the south west of Gaul, in the kingdom called Aquitaine, at the turn of the first millenium. 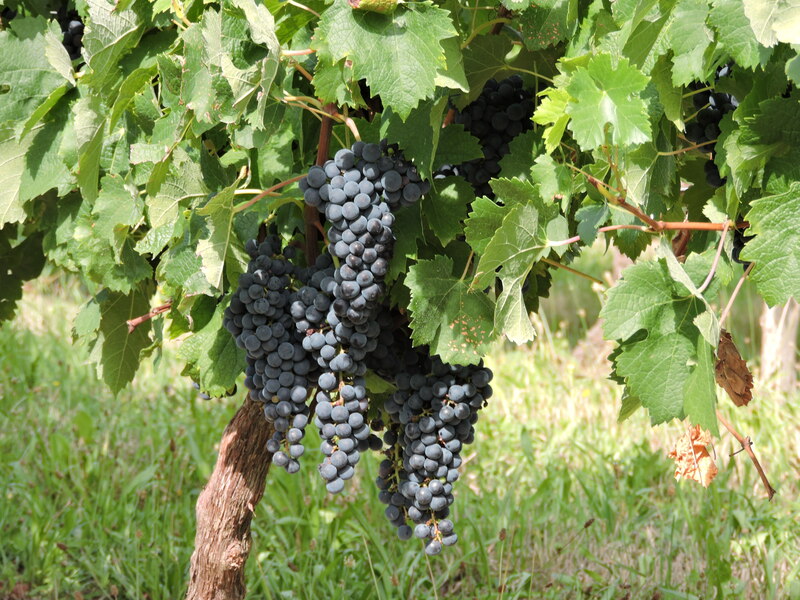 They planted vine cuttings, possibly from Spain, to supply their soldiers with wine, and encouraged laic lords, and monasteries to plant on their lands, teaching them the art of winemaking. From the Middle Ages, winegrape was grown extensively, and produced mainly for export, with links favoured between Bordeaux and England. The Plantagenet Kings Of England possessed Gascony and Aquitaine for three centuries, and granted Bordeaux tax exemptions. Today, in L’Entre Deux Mers, there are two and a half thousand hectares of land devoted to the making of good white, and generic red Bordeaux wine, which is exported across the world. 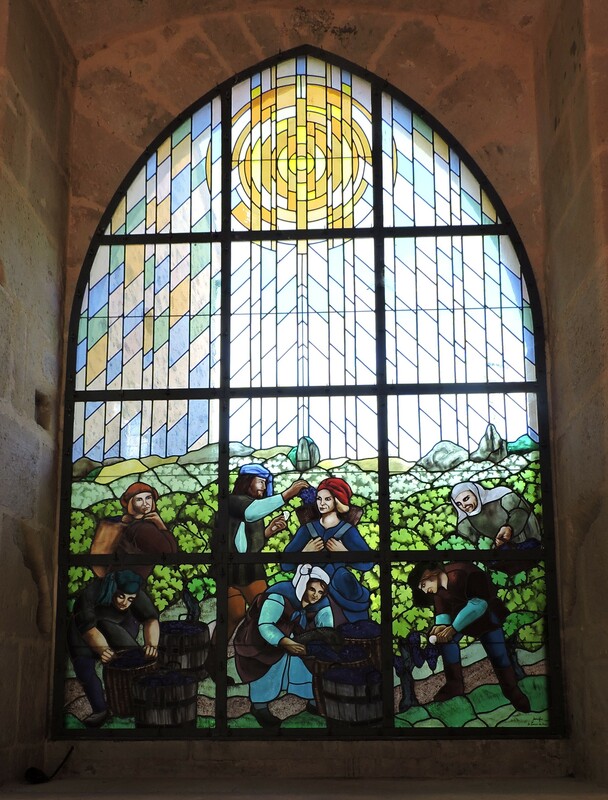 Looking out on the Vendange of the Middle Ages, as seen through the stained glass window of Rimons Presbytery. 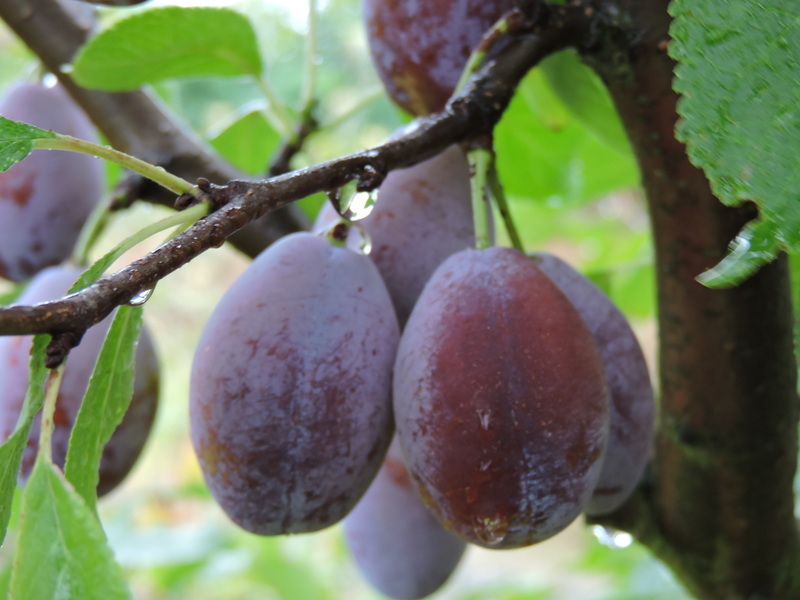 * If you would like to know more about les Pruneaux d’Agen, an older post is here.